Warning to family members: Reading this blog post could ruin Christmas. That is all. At the end of October I set out to knit something special and colorful. A gorgeous and simple shawl. I chose this stunning Stole pattern from Wear With All, by Theresa Gaffey to knit as a Christmas present for my almost-mother-in-law. For six weeks I knitted away happily. The pattern is a dull 8×8 rib, but hey, it’s perfect for knit nights and other times when I need a no-brainer project. By Thanksgiving, I’d finished two out of eight loooong stripes and I realized that I had a problem. The problem: The shawl must be completed by December 19 in time for Christmas travels. The task: Finish knitting six more sections of the shawl, each one taking approximately 8 hours (that’s 48 hours of knitting, folks). Then block it and wrap it. The price: Put aside all other fiber projects, knitting and spinning alike, no matter how much I want to pick them up. No longer will this be my knit night project. This must be my every-spare-moment-until-I-get-it-done project. With a groan, I settled down to the task. Don’t get me wrong, I really enjoyed this project and the Isager yarn was gorgeous to work with. But 48 hours of 8×8 rib? Can we say OOG? Tonight I peeled the shawl off my blocking boards. It was a photo finish, just hours before departure. Before I wrapped it, I took pictures to share. As I was snapping away up in the craft room I had a sudden niggling feeling of deja vu. I’ve seen this shawl somewhere before. I am a walking work of art. Such a dazzling coat of many colors. 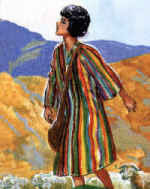 How I love my coat of many colors. Oh good grief! I just knitted the amazing technicolor dream coat. Err…stole. It does look it, doesn’t it? Now I’m sunk. I’m going to have that song in my head ALL WEEK. Andrew Lloyd Webber, get out of my head. Out out out! It looks fantastic though! 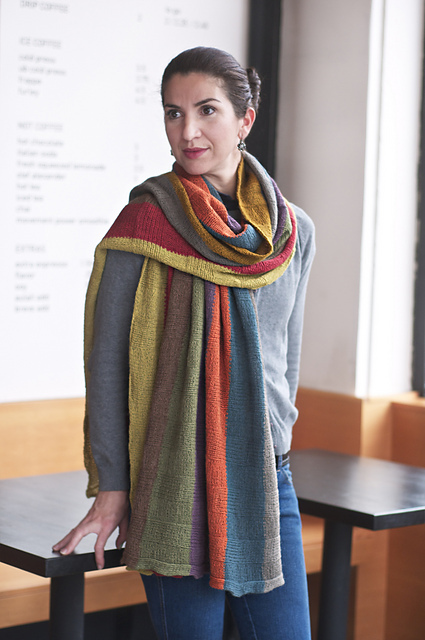 I would definitely make one for myself, if I wore stoles, or liked knitting 8×8 ribbing. Don’t worry, it’s less technicolor than you think! gorgeous! what a task tho! congratulations on finishing it. While I’m not a fan of Andrew Lloyd Weber, I actually enjoyed Technicolor Dreamcoat. And I LOVE this stole. Absolutely beautiful and I’m sure she will love it. (If I was your MIL, I certainly would). I happen to love your amazing technicolor dream stole and would be perfectly content if you were to box it up and send it to me. Q – Gorgeous! Ditto what Suzy said. LOL about the song in your head! I “share” the song in my head by humming or singing out loud! Spread the wealth. 😎 My students would purposely try to come up with a song that would stay in my head all day! Eep! Long-haul deadlines like that make me loony. Sure looks worth it though! I think it was worth it. Mostly. Although you better believe I started spinning and knitting small projects almost immediately. It’s amazing how necessary and rewarding small projects are after a huge one. I would like to nominate you for a blog award – I think your posts are fab and I love seeing your makes and how you connect things as you have with this inspiring post. I have recently been lucky to recieved 2 to pass on, The Sisterhood of the World Bloggers Award and Liebster – so please feel free to pick which ever one you would like. Happy New Year and Happy posting!